Your assertion is fundamentally wrong – a clear case of a little knowledge being used to justify what you want to be true, rather than an unbiased analysis of the situation. The “law of the sea” that you refer to is articulated in the “International Regulations for Preventing Collisions at Sea, 1972” (link), colloquially known as the Rule of the Road or the ColRegs, which it appears the Captain of the Lanzhou contravened in at least 3 respects. 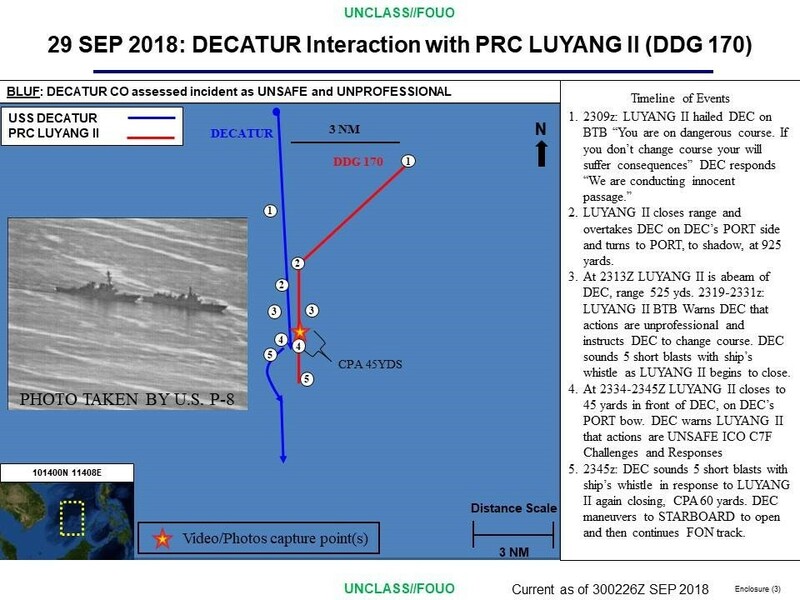 Taking Point 1 as the start of the interaction, the 2 destroyers are potentially in a crossing situation with the ensuing risk of collision, Decatur being on Lanzhou's stbd bow. ColRegs Rule 15 states “When two power-driven vessels are crossing so as to involve risk of collision, the vessel which has the other on her own starboard side shall keep out of the way and shall, if the circumstances of the case admit, avoid crossing ahead of the other vessel.” The Rules require the stand-on vessel (Decatur) to “keep her course and speed” and the give-way vessel (Lanzhou) to “take early and substantial action to keep well clear”. This should have been effected by Lanzhou turning to stbd; instead she turned to port. The photo below shows that Lanzhou positioned herself on Decatur's port quarter which is reflected at Point 2 in the track plot. At that stage, Lanzhou is more than 22.5 deg abaft Decatur's beam (>112.5 relative to ship's head) so the situation has become a potential overtaking manoeuvre. ColReg Rule 13 requires the overtaking vessel (Lanzhou) to “keep out of the way of the vessel being overtaken”. Rule 13 further states “Any subsequent alteration of the bearing between the two vessels shall not make the overtaking vessel a crossing vessel within the meaning of these Rules or relieve her of the duty of keeping clear of the overtaken vessel until she is finally past and clear.” The significance of this is that once Lanzhou got ahead and Decatur was more than 22.5 deg abaft Lanzhou's beam rather than Decatur having “sole responsibility to not collide” that you state, the requirement remains with Lanzhou to keep well clear until it had fully overtaken. You are also wrong to assert that either ship has the sole responsibility not to collide – it always remains the responsibility of both ships to avoid collision. Consequently ColRegs states that when “the vessel required to keep her course and speed finds herself so close that collision cannot be avoided by the action of the give-way vessel alone, she shall take such action as will best aid to avoid collision.” This is reflected in the turn to stbd executed by Decatur at Point 4, even though she was the stand-on vessel, but complied with ColRegs by taking such action as was necessary to avoid a collision – Lanzhou did not. In summary, there is no evidence that Lanzhou's captain “knew the law of the sea” and that the PLAN's “sea law training is impressive” – rather Lanzhou flagrantly disregarded ColRegs and deliberately created a situation in which there was a high risk of collision. The ColRegs are intended to ensure that ships in relatively close proximity continue to navigate safely. I do not fully understand what you are saying in “Using GPS or Baidu sat nav systems, and computer controlled thrust, it is quite possible to construct a precision sea navigation rule enforcement” but if you are suggesting that deliberately creating a close quarters situation can be done whilst adhering to the ColRegs, you are wrong. The onus remains on all bridge watchkeepers not only to avoid collision but also to avoid the risk of collision. I don't know in what sense you are a “Strategic Analyst” but the conclusions of your analysis of this tactical encounter are wholly wrong. I cant see an issue with the Lanzhou turning to port instead of starboard as there appears to be a distance ofseveral hundred meters between the ships for the turn to be executed safely. Why the griping that the Lanzhou was only about 45 meteres abeam of the Dec.Is'nt that about the distance between two smaller ships that are reprovisioning at sea.? N00813, mr.bean, bd popeye and 3 others like this. N00813, mr.bean, AeroEngineer and 6 others like this. It’s fitted with twin Yamaha outboard motors, wonder what the horse power is. If you were on a passenger ferry in open water and another ship passed within 45m of you, I don’t think you would conclude that it was being navigated in compliance with the ColRegs - which was the erroneous assertion in Strategic Analyst's post. This is not a civllian ferry situation. Its two navaĺ destroyers whose two crews have been trained to traveĺ 45 to50 meters abeam of each other when replenishing. In the current situation, one was telling the other to 'shove off'. Even those 800000 ton a/c are abeam at 90 odd meters because of the deck overhang. N00813, bluewater2012, Dolcevita and 2 others like this. I don't see a point to argue about the recent DDG encounter between USN and PLAN. Both are right according to their own reasonings, but wrong according to the others. One is exercising "right", the other is enforcing law. As in daily life, police will deliberately ram a suspect's car to stop it. There is nothing shameful for the police to be aggressive. On the other hand, the suspect will claim his right so long as no legal judgement can be put on him. N00813, mr.bean, jobjed and 2 others like this. So two of the elongated 052D, one 055 and another ship which could be any of the two. Actually looks a bit more like 052 to me but it's too early to be sure.